Chiropractic is a health care approach and profession that emphasizes diagnosis, treatment, and prevention of mechanical disorders of the musculoskeletal system, especially the spine. These disorders can affect your general health via the nervous system. The main treatment involves manual therapy. This includes manipulation of the spine, other joints, and soft tissue. Treatment also includes exercises, health, and lifestyle counseling. At Caron Chiropractic, we emphasize noninvasive treatment to minimize risk to avoid surgery and medication. Using a patient centered approach; we also emphasize the body’s natural self-healing abilities. Spinal adjustments are used successfully to treat a variety of different soft tissue disorders as well as a number of other health problems. Research has shown spinal adjustments to be the most effective treatment in numerous conditions, including back pain. Chiropractic offers a complete range of natural health services, including chiropractic, therapeutic message and acupuncture. These services have been very successful in treating sports injuries, work injuries, and an assortment of other health conditions. Do you need treatment for back pain? Were you involved in an auto accident, or suffer from chronic body aches? To heal injuries associated with auto accidents, work, social and sporting activities, Caron Chiropractic provides methods that combine medicine, chiropractic and physical therapy. With a dynamic combination of medicine, physical therapy, nutrition, exercise, and message treatment for our patients, we are committed to relieving our patients from back and neck pain, knee aches, joint pains, and other ailments. Improving the overall health of our patients is very important to us. 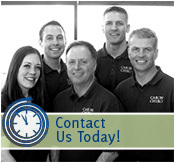 For complete individualized care, consult with one of our professional physicians at Caron Chiropractic. Contact us today for more information about our specialty treatments, such as Craniosacral Therapy and Spinal Rehabilitation. For A Pain Free and Healthy Life… Chiropractic! This entry was posted	on Tuesday, March 13th, 2012 at 6:00 am	and is filed under Chiropractic Treatments. You can follow any responses to this entry through the RSS 2.0 feed. You can leave a response, or trackback from your own site.